So, a new Ms. Marvel then. With most superheroes, when you take away the colorful costume, mask and cape, what you find underneath is a white man. But not always. 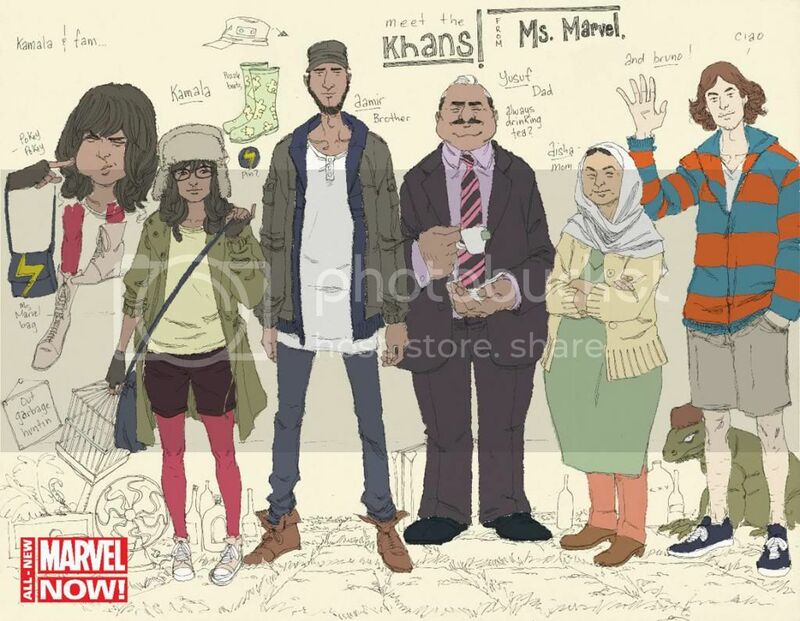 In February, as part of a continuing effort to diversify its offerings, Marvel Comics will begin a series whose lead character, Kamala Khan, is a teenage Muslim girl living in Jersey City. No exploding planet, death of a relative or irradiated spider led to Kamala’s creation. Her genesis began more mundanely, in a conversation between Sana Amanat and Steve Wacker, two editors at Marvel. “I was telling him some crazy anecdote about my childhood, growing up as a Muslim-American,” Ms. Amanat said. “He found it hilarious.” Ms. Amanat and Mr. Wacker noted the dearth of female superhero series and, even more so, of comics with cultural specificity. Kamala, whose family is from Pakistan, has devotedly followed the career of the blond, blue-eyed Carol Danvers, who now goes by Captain Marvel, a name she inherited from a male hero. When Kamala discovers her powers, including the ability to change shape, she takes on the code name Ms. Marvel — what Carol called herself when she began her superhero career. Kamala will face struggles outside her own head, including conflicts close to home. “Her brother is extremely conservative,” Ms. Amanat said. “Her mom is paranoid that she’s going to touch a boy and get pregnant. Her father wants her to concentrate on her studies and become a doctor.” Next to those challenges, fighting supervillains may be a welcome respite. But “this is not evangelism,” Ms. Wilson said. “It was really important for me to portray Kamala as someone who is struggling with her faith.” The series, Ms. Wilson said, would deal with how familial and religious edicts mesh with super-heroics, which sometimes require rules to be broken. Marvel’s slate of titles with female or minority leads includes an X-Men series spotlighting its women and “Mighty Avengers,” whose roster includes many nonwhite heroes. Next year two more female characters will get series: She-Hulk and Elektra. But the quest for cultural diversity in comics is not always successful. The market can be unwelcoming to new characters and attempts at inclusion can seem like tokenism when not handled well. Then there are the firestorms: In September at DC Comics, the writers of Batwoman, announced that they were leaving the series because of editorial interference, including an edict that would prohibit the lesbian title character from marrying. Dan DiDio, the co-publisher of DC Comics, said the decision was about keeping true to the mission of the Batman characters, who have sacrificed their self-interests for the greater good. They “shouldn’t have happy personal lives,” Mr. DiDio told fans at the Baltimore Comic-Con. The most important fan assessment, though, comes later and is easier to quantify. “Fans respond with their dollars,” said Axel Alonso, the editor in chief of Marvel Entertainment, who thinks Miles has helped bring new readers to comics. “When you see Spider-Man strip down his mask and he looks like you, you are more inspired to pick up that book.” The September issue of Miles’s series sold around 32,000 copies. The more traditional version sold around 80,000 copies, though Peter Parker is seemingly dead and Doctor Octopus is acting as Spider-Man. 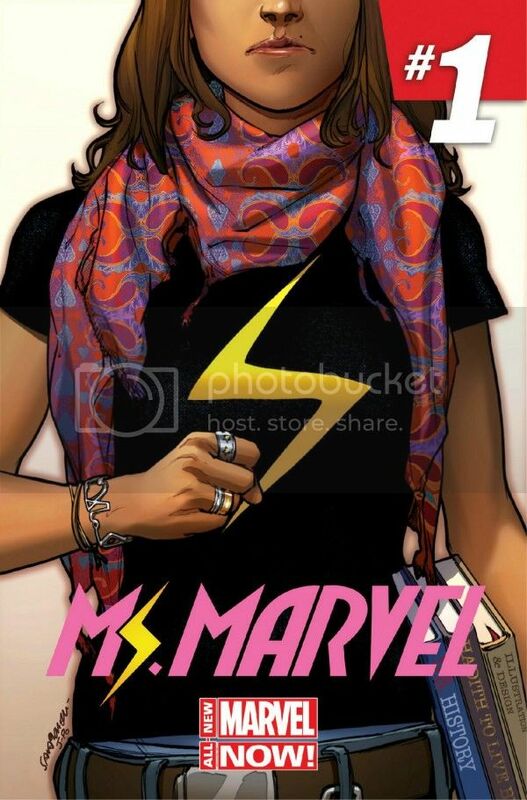 As for Kamala, Ms. Wilson said the series was “about the universal experience of all American teenagers, feeling kind of isolated and finding what they are.” Though here, she adds, that happens “through the lens of being a Muslim-American” with superpowers. This could be interesting. Personally, I liked Carol Danvers Ms. Marvel identity better than having her be Captain Marvel so I was hoping to see her back as Ms. Marvel before to long, but this is at least better than Moonstone as Ms. Marvel (I actually like Moonstone in the T-Bolts, but I thought Dark Avengers sucked). I'll definitely give this a chance, although I doubt it will make enough money to last long. Why is there no mention of the porcupine with the fake Hulk gloves? And why is that not a finished bit of art, just a coloured sketch? They're dripping the art out for this one. Maybe there are no finished pages yet? They've released a sketch of the supporting cast. And the cover of #1 (which is pretty much a rip of Supergirl #1 from the 90s). I'm quite sad to hear this, KSM was doing a great job. Hopefully we can see Carol somewhere in an Avengers book, but please no more new ongoings. 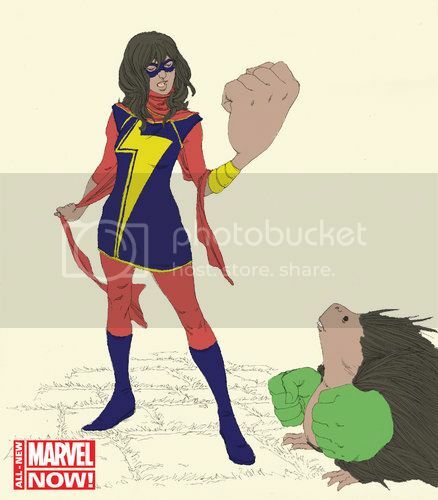 This Ms. Marvel series is in addition to the CM ongoing. Captain Marvel is getting a relaunch with Carol Danvers still in the spotlight, written by Kelly Sue DeConnick and art by David Lopez (on the first arc at least). I don't know how I feel about this one but I am liking the art. Just read the preview story in the point one issue, man this is gonna be a good book. Cant wait for the first issue to drop. Am in two minds about this. I was only ever a Ms Marvel fan when it was Carol. A completely unrelated Ms Marvel doesn't hold a lot of pull for me. I may try the first issue as the Point One preview was okay, but will have to be really impressed to keep with it. Anyone else read this first issue? I thought it was great, Kamala was a character that for me was extremely likable just from the first issue. It kind of reminded me of Peter Parkers story when he was starting out just told through a different set eyes. The art was really awesome as well. 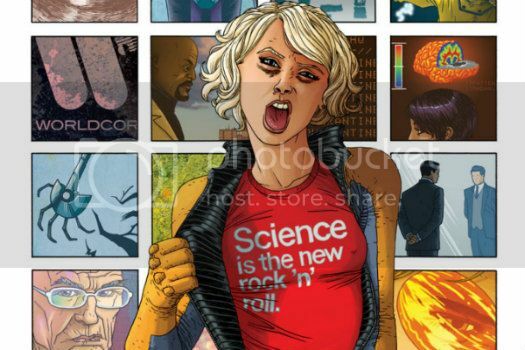 I thought the character herself was good, but the first issue's story was mostly mediocre. It didn't really hold my attention, and parts of it (like the ending) were really annoying. I think I'd like the character if she were in a book like Avengers Academy, but I'm not going to continue reading her ongoing. I think the premise is interesting and the first arc might be worth a shot. Art's pretty good too. I like that they are bringing in more minority heroes. Also it's nice how they are transitioning the name over. Kinda like they did with Miles Morales. It works well that way.